A few weeks ago, I processed the four extra male quail. While I had previously helped clean (and then ate) two of my quail from a previous hatch, this was the first time I had done the entire process all by myself…including the kill. It was a weird thing. I’ve spent about 40 years raising animals, and nursing them back to health when injured. I did kill a wild mouse once that was caught in a trap, but that was only time I’ve ever deliberately killed an animal. The hardest part of the whole process was simply the before: picking the quail up, soothing it so it wouldn’t struggle at the wrong time, then deliberately thinking: Yes. I’m doing this. It just went so counter to all my instincts. The actual physical moment of doing was shockingly easy and simple. (I used the scissors method, because I felt it seemed the quickest and the most humane.) Afterward, holding the lifeless body as it convulsed and bled out was not fun, but not nearly so traumatic as I thought. I knew it was dead, so it wasn’t like holding a ‘dying animal’. I don’t think I could ever use the throat slitting method on a critter – I couldn’t stand the long several minutes waiting for it to die. Afterward, I did feel bad, but not to the extent that I wouldn’t process more animals. If I’m going to eat meat (and I am), it feels so much better to have control over how the animals lives, and how it dies. It makes me sick to read and see how the animals in factories are raised and killed. I don’t want to support that industry, that sort of torture and inhumanity. I also don’t want to eat that sort of polluted food. I don’t agree with or support PETA as an organization, but this video does a good job of showing what goes on in those factories. Quail, however, are not going to be a meat animal for me – unless I have a few extra males that I have to dispose of in the future. Four adult quail made enough meat for one meal. I don’t like that ratio of death. With a standard sized chicken or duck, I can get up to four meals from one death. Maybe more with a rabbit. The other thing I don’t like with quail is how many tiny little bones they have. They are seriously like fish bones! I tried to be super careful with my de-boning, and I still missed a few. And the taste of the meat is not my favorite, either. I wouldn’t call the flavor ‘gamey’ precisely, but it’s quite different from chicken, and nowhere near as fantastic as duck. Quail just aren’t worth it, as meat animals, in my opinion. 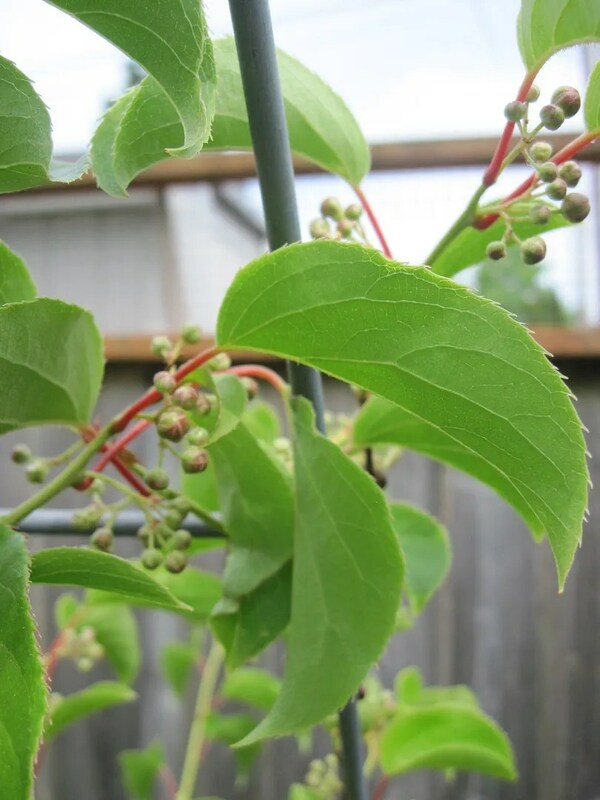 However, I do adore them as garden companion animals – and they will be even more helpful once I get the rotating garden bed/quail cage set up and operational. And I like the eggs; I’m getting into the habit of throwing a few quail eggs into whatever dish I am making. I can’t ever see myself not wanting quail as part of my little homestead. And now on to happier things. 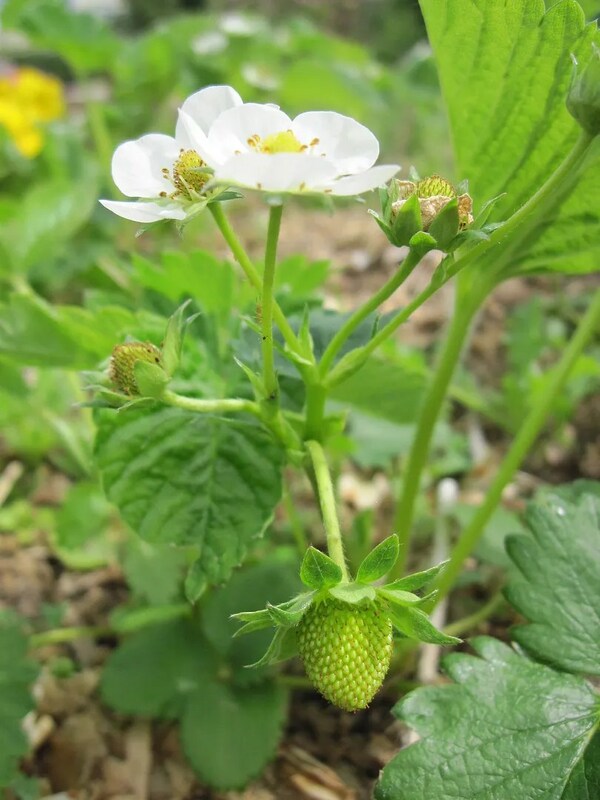 Here are some photos from last week in the garden. 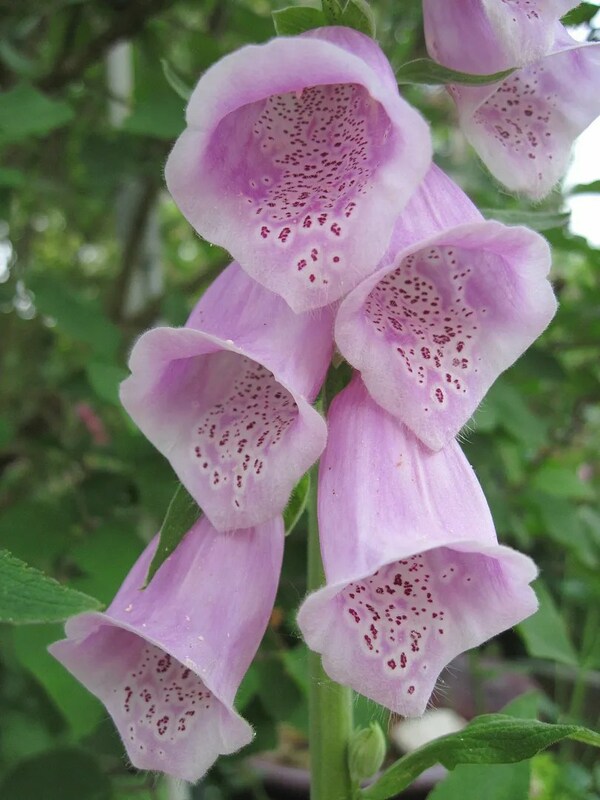 The foxglove and roses are in full swing. 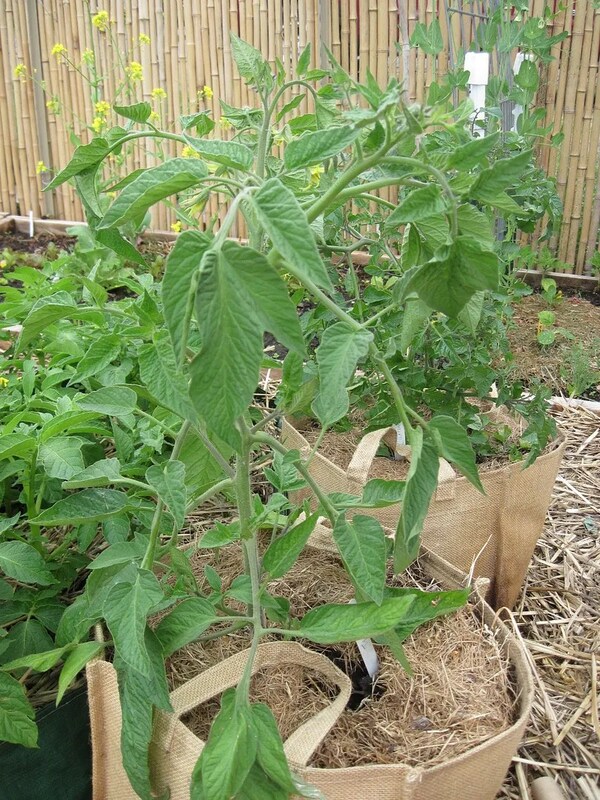 The two tomatoes in the grow bags seem to be winning the contest, as far as growth and health are concerned. 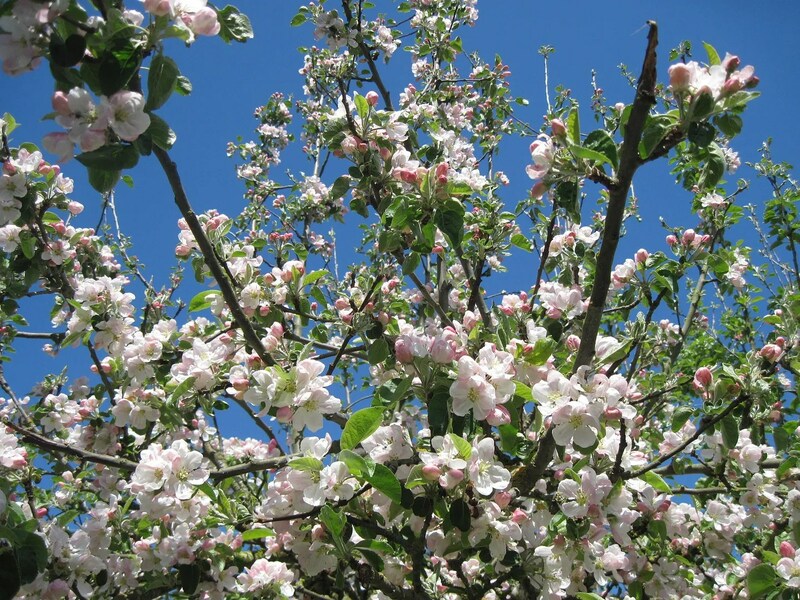 That could also be because they were the last I put out, when the weather had finally turned to a proper Spring. In front there is a Black Japanese Trifele tomato. This is my first time growing it, and so far, it’s brilliant. Look at the flowers! They are HUGE. Below is a shot of one of the straw bales. 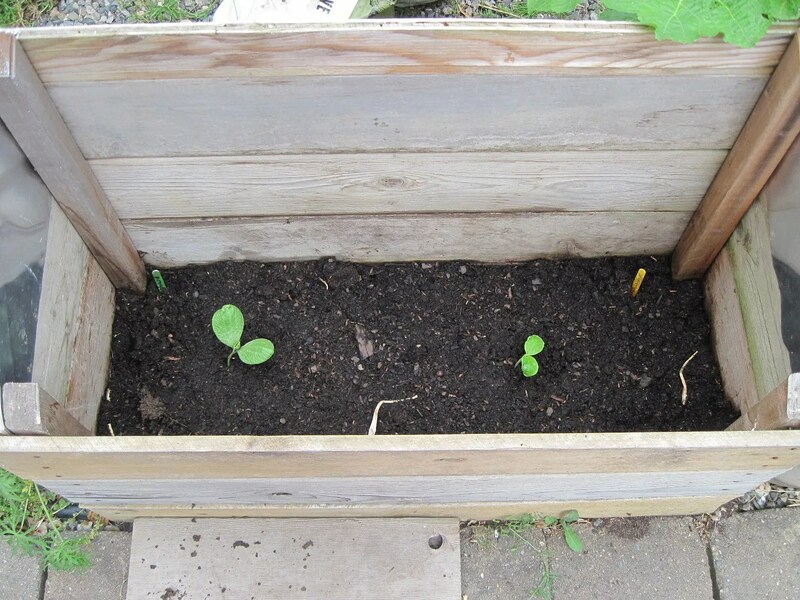 I poked several squash seeds down into them a few weeks back, and now they are coming up nicely! 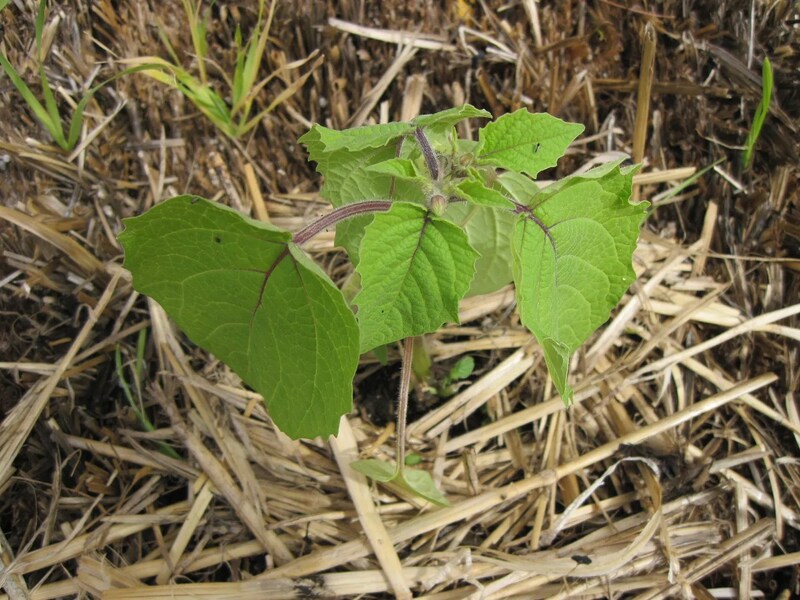 Below is one of my potato patches. Potatoes are in the innermost square, and beets are around the outside. 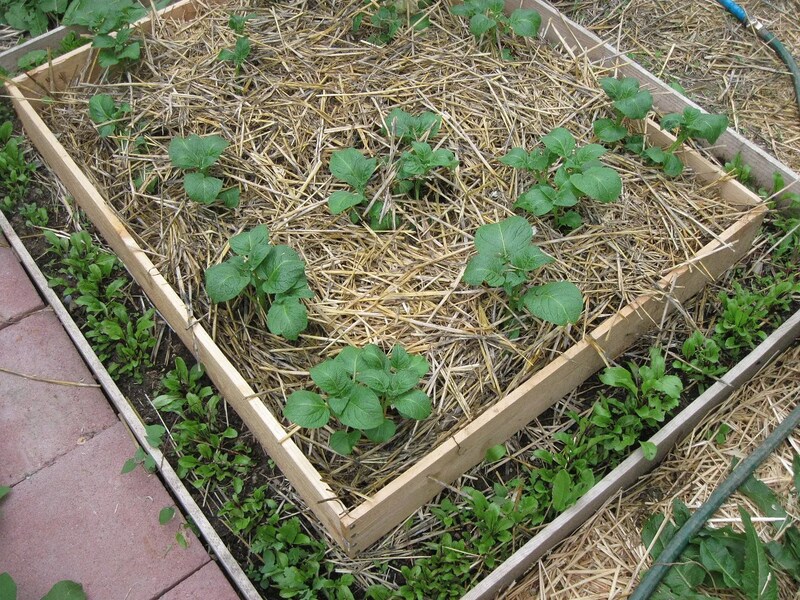 I keep piling on more straw as the potatoes grow. Adding more is on my list of things to do this weekend…. Because I’m not using the cold frames for anything, I decided to try growing summer squash in them…with the lids left raised, so the vines can tumble out. So far they appear to like it. This morning, they were already a good four times larger than this. When I was inspecting the front yard garden this afternoon, I surprised a wee wild bunny doing an inspection of her own. I didn’t see that she’d damaged anything – other than trampling down one sunflower and snapping its stem. That was hardly her fault, though – it happened when I surprised her and she was frantically trying to get away from me. I may have to put some bunny-proofing out there if she becomes a regular visitor, though! 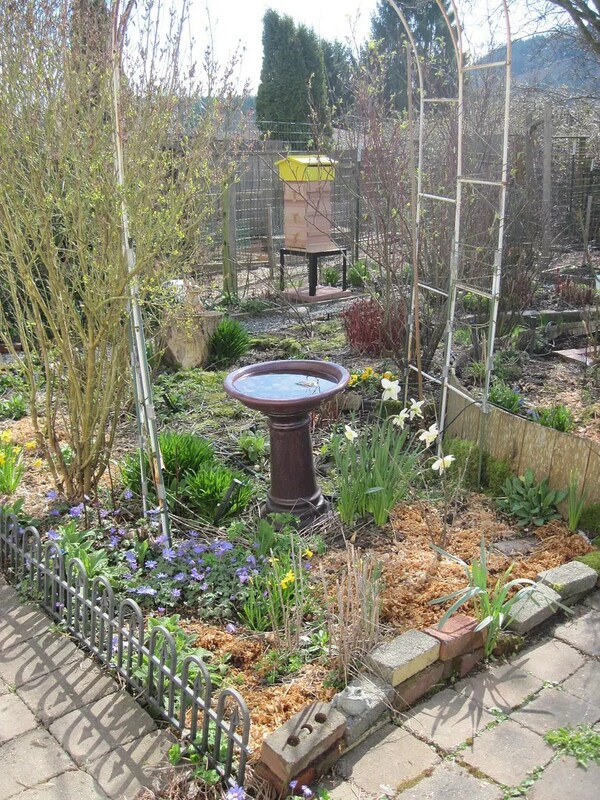 And the bees…sadly the bees are going to be a failed experiment this year. I think too many bad things happened to them (difficult long trip through the mail, dead queen, wet weather) and their numbers are dwindling rapidly. 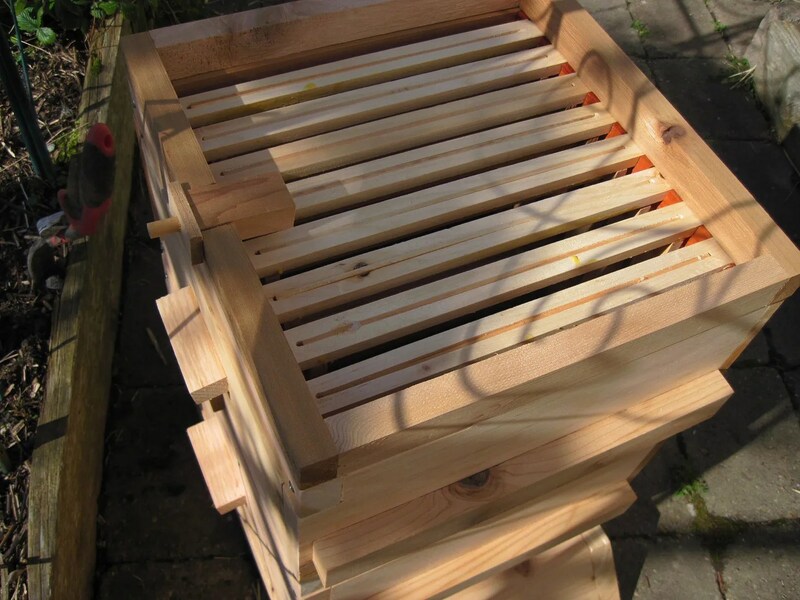 Bees only live for a few weeks, so when starting a new hive, they really need to get off to a fast start – they need that next generation or the colony will die of old age. Right now we’re down to fewer than 100 workers bees. I suspect as well that something is up with the new queen. Either she was not accepted, or she died, or something. The brood that has been laid seems to be all drones (males). 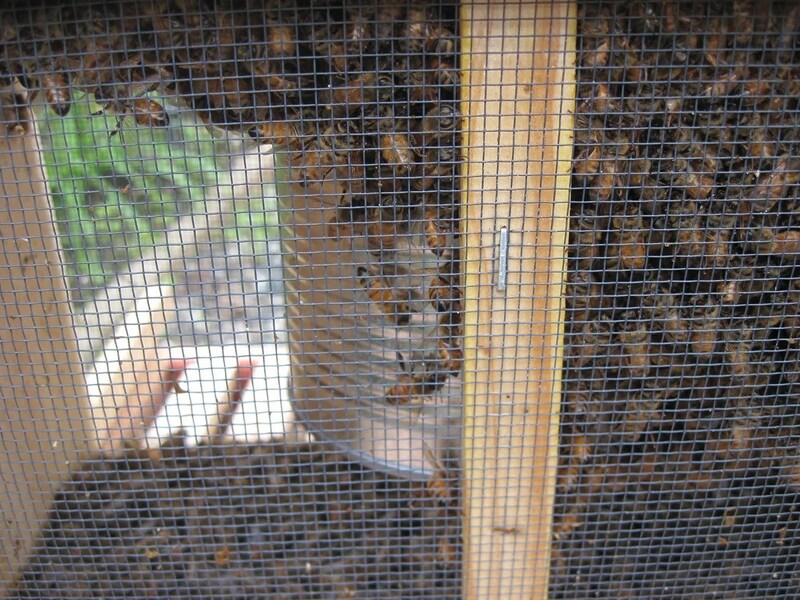 This can happen if a hive goes too long without a queen. 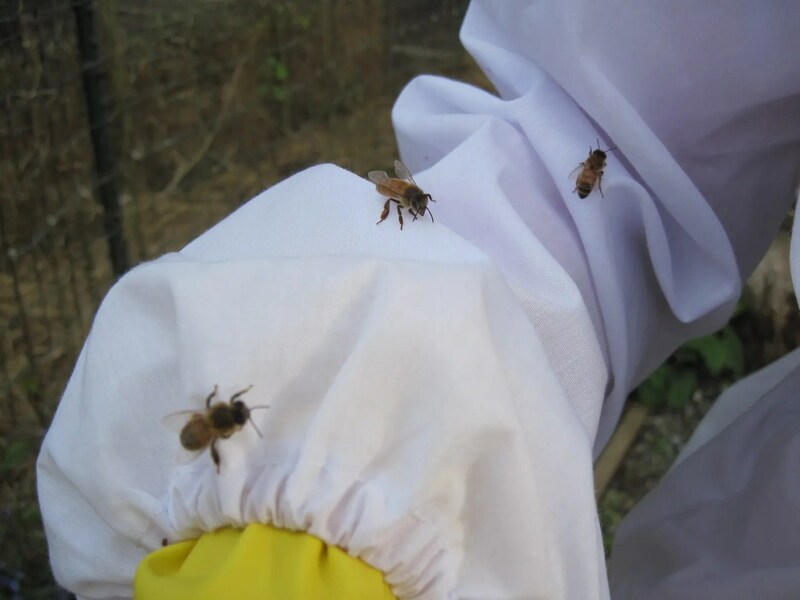 One of the worker bees decides to become a queen, but unlike a true queen, a worker is only capable of laying drone eggs. We’ll start over again next Spring. I found a guy who naturally raises bees (no chemicals or pesticides used in his hives). 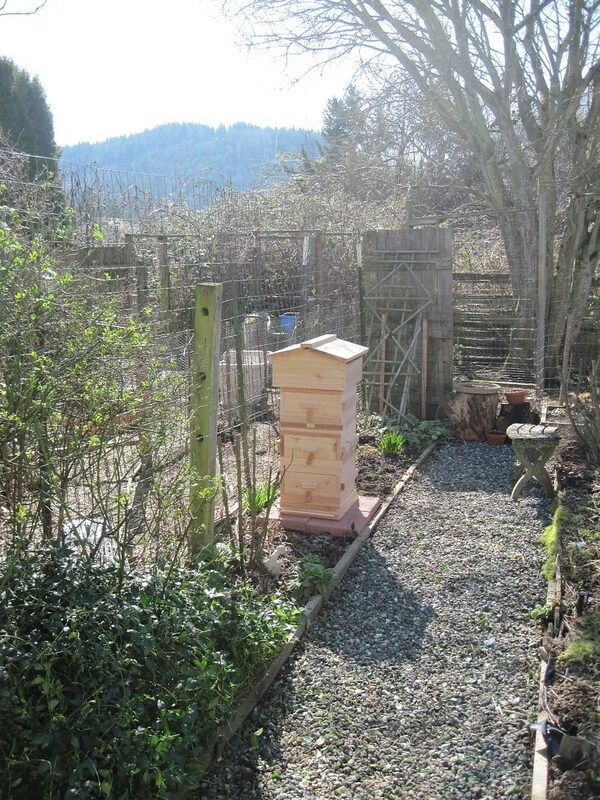 His bees come from Oregon (so they will be used to my climate) and he delivers to my area. Unlike the bees I ordered this year, his bees will arrive within one day. I wish I could have gotten them from him this year, but we started so late that he was sold out. Well. 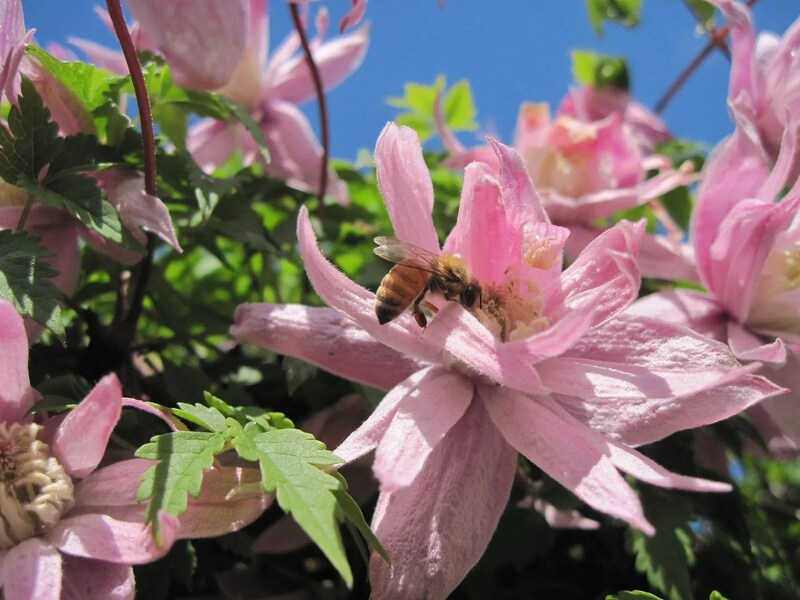 At least we know we love having a hive, and really enjoy the bees! 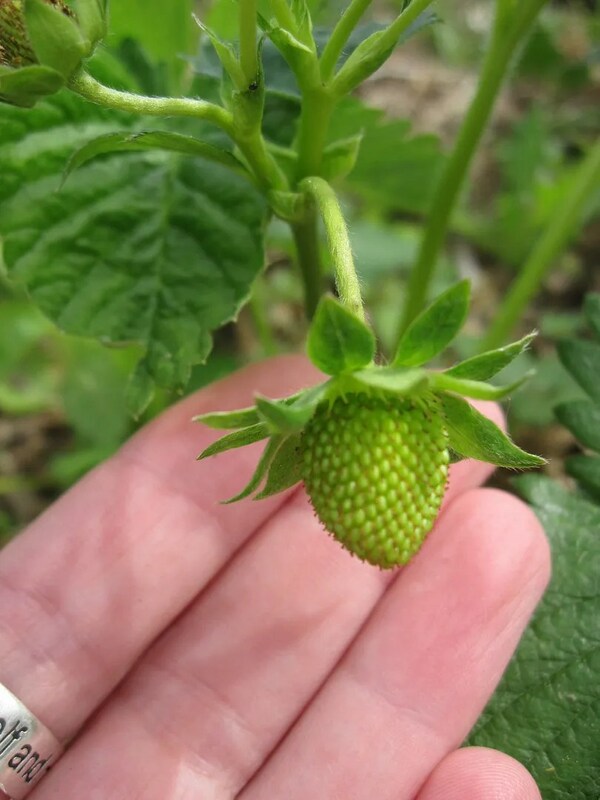 And the strawberries I planted on the quail coop roof garden are doing wonderfully. My from-seed ground cherries are doing very well. 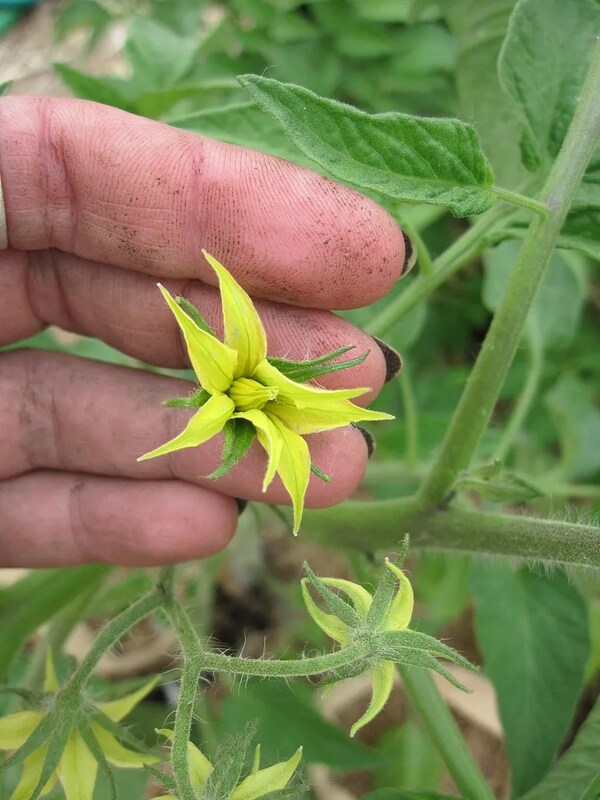 I’ve never tasted a ground cherry before; I’m really looking forward to harvesting fruit. 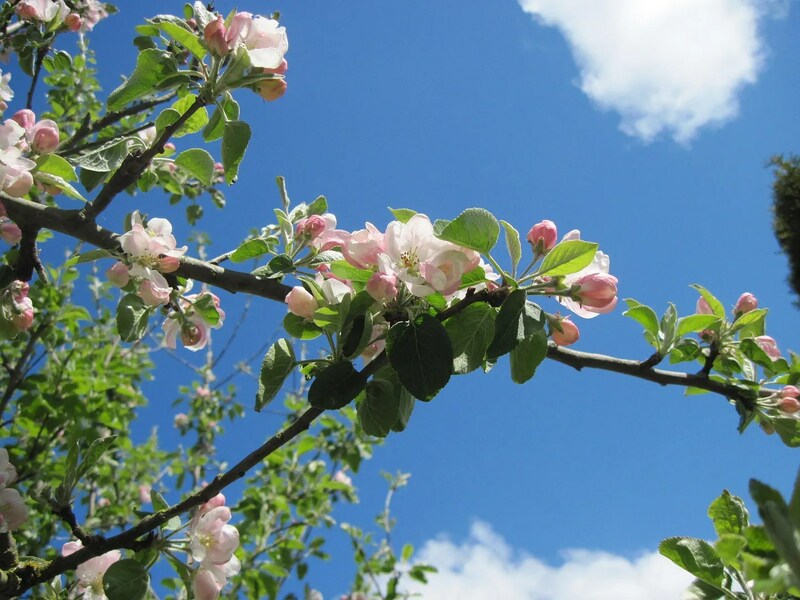 The pear and apple espaliers have a long ways to go, still, but they are leafing out and looking pretty. 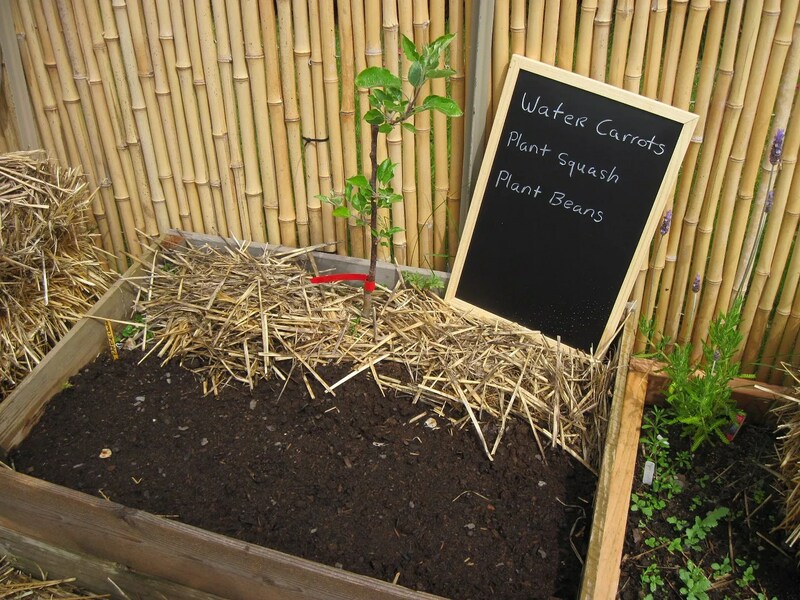 I found a cheap blackboard, and put it out in the garden. I still need to find a place to hang it, but I think it looks really cool out there! 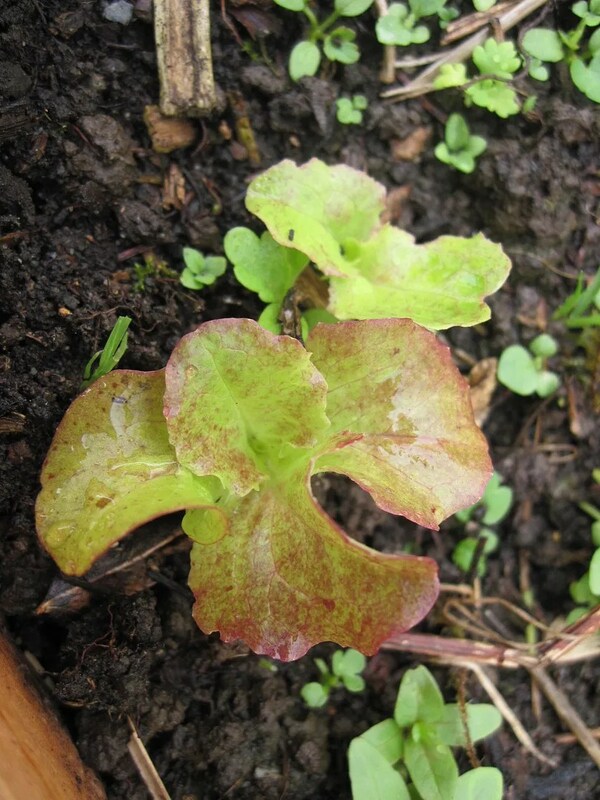 I have lots of little lettuces coming up. 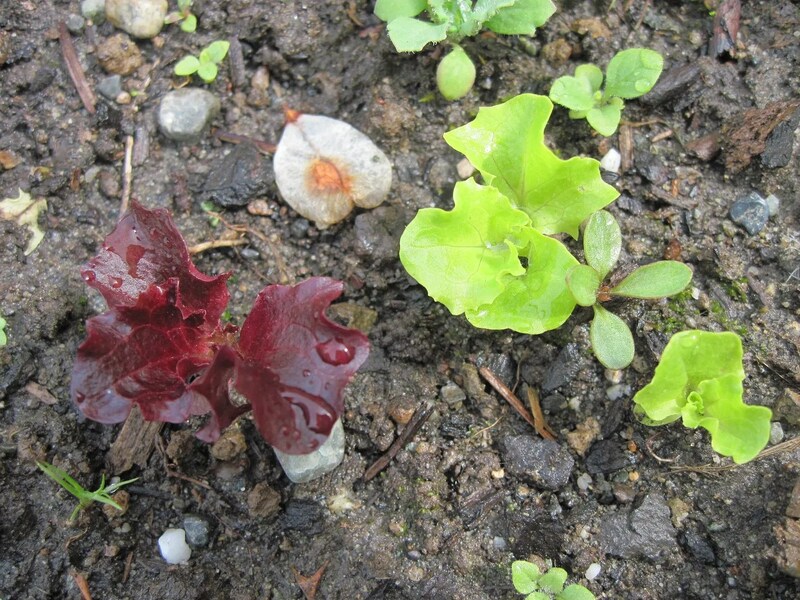 I love all the different colors and leaf shapes of lettuce. It’s such a pity some people only are familiar with store-bought iceberg. And the names! This next is called: Frizzy Headed Drunken Woman. 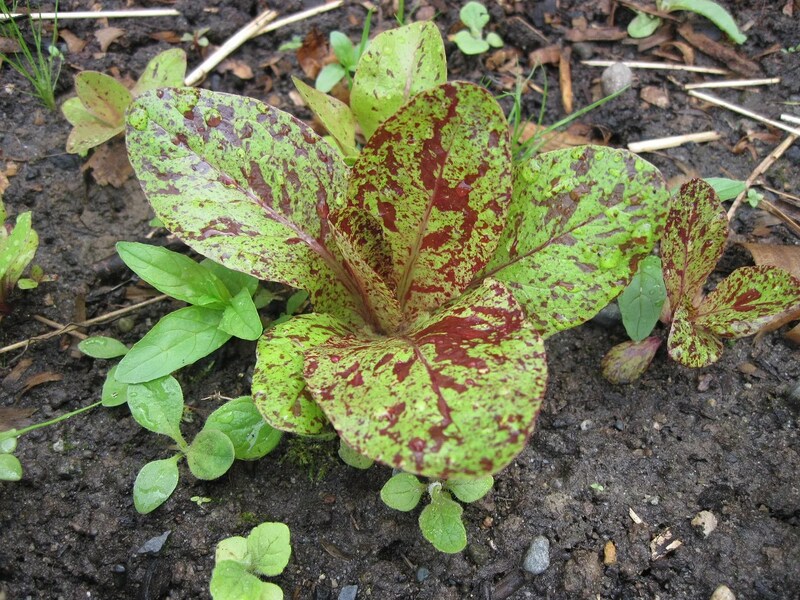 Who wouldn’t want such a disorderly lettuce in their garden? I hope she doesn’t corrupt the beets…. 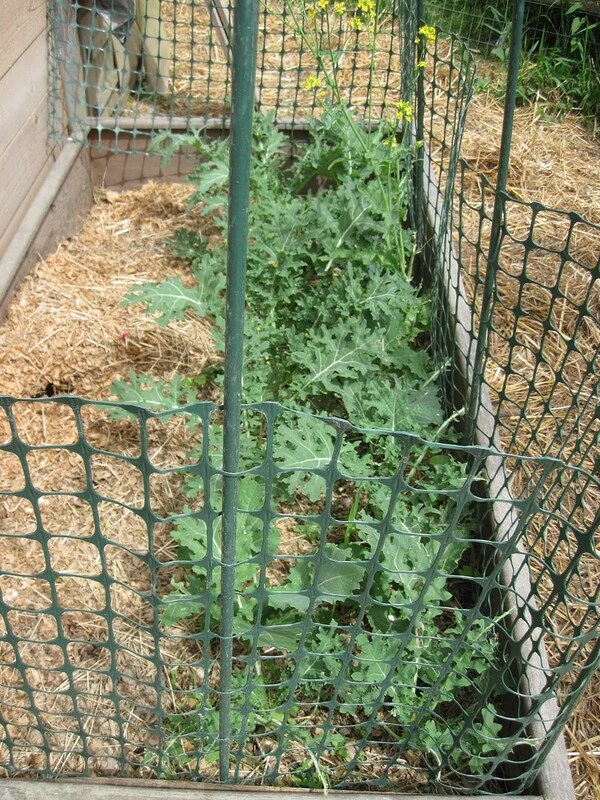 The chicken’s kale patch is growing up – and soon I’ll be putting out quinoa seedlings in behind them. 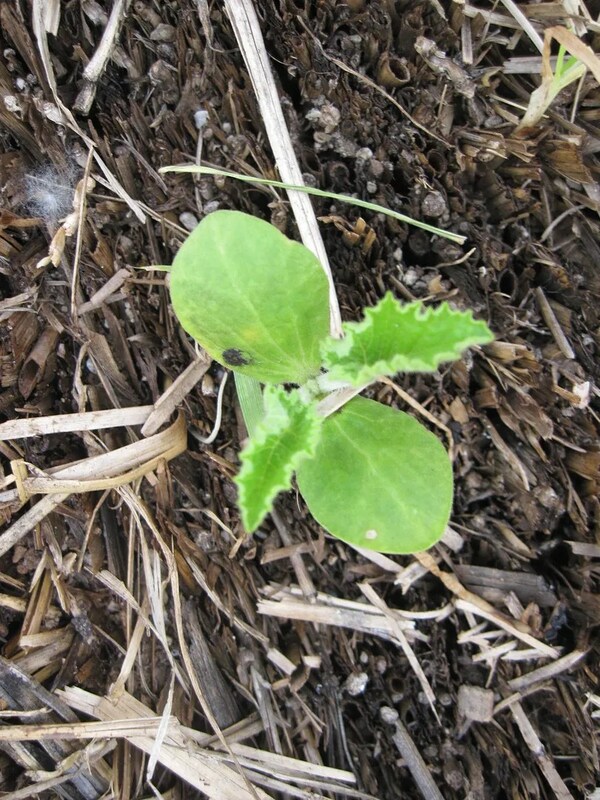 I’ve never tried quinoa before, but if it’s successful, the quail will adore the seed heads. 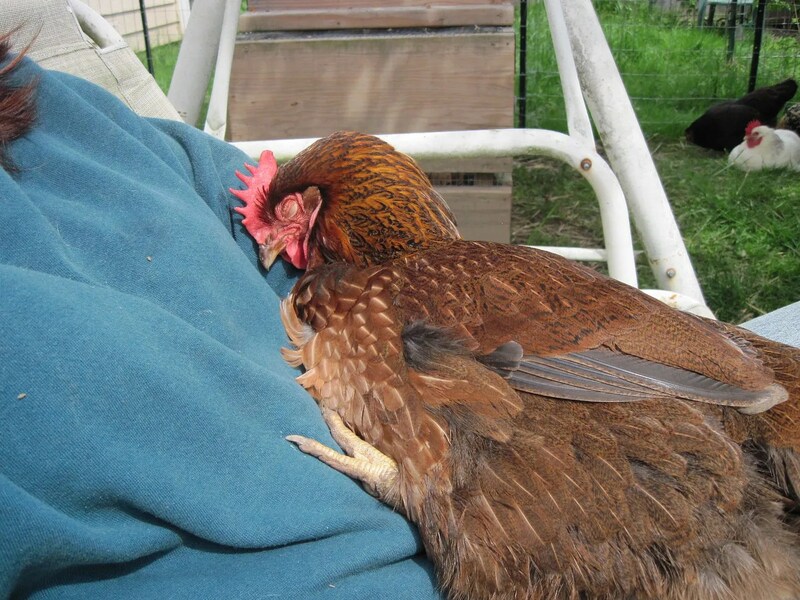 Speaking of the chickens, my favorite girl, Ellie, likes nothing more than to sleep/sunbathe in my lap. She’s been too camera-shy to let me get a picture before, but today she was just too sleepy to care. She’s a very smart chicken. 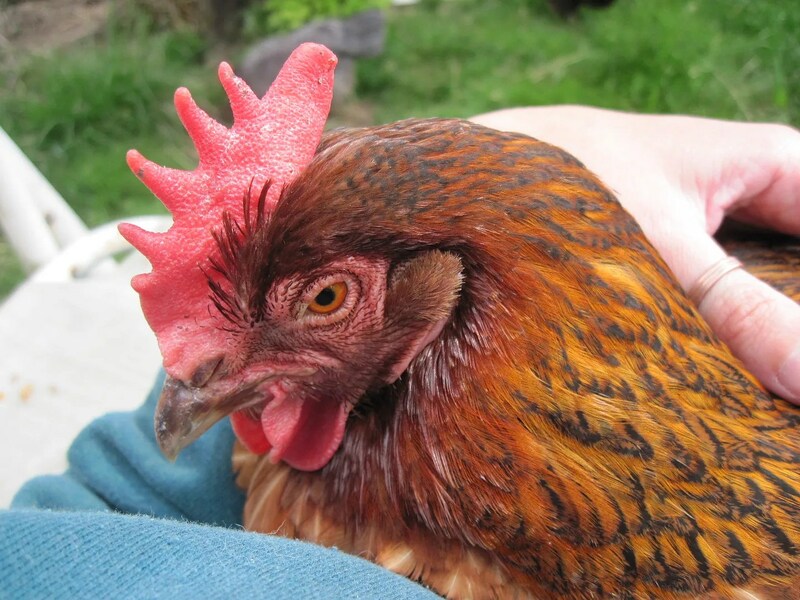 It took me awhile to catch on, but she communicates her desires to me by pecking me. On the foot, if she wants me to go somewhere (like take her out to garden compost bin to dig for worms). On the knee, if she wants me to sit down, so she can take a nap on my lap! Since I figured this out, I’ve been testing it, and it’s definitely true! 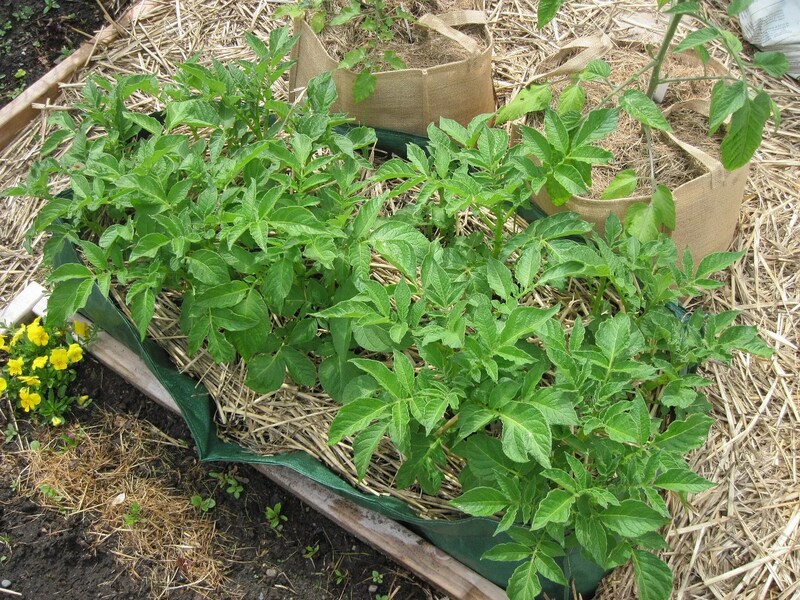 I also have healthy looking crops of potatoes…but we’ll have to wait to see how many potatoes actually grow. I’m testing three different methods: in the ground, in grow bags, and in a trash can. Here is a few in a grow bag. And the bees? 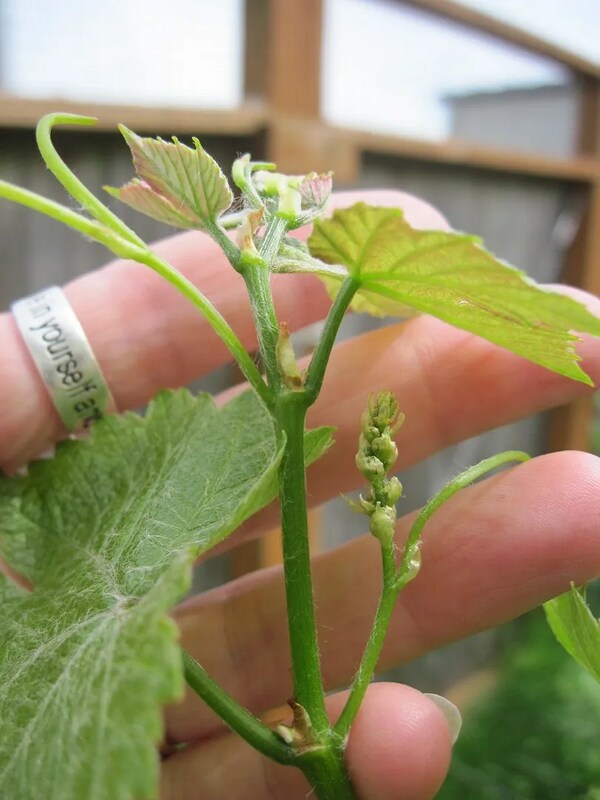 They appear to be doing well, and I hope I’ll see some newly hatched bees soon. They are definitely busy making comb. 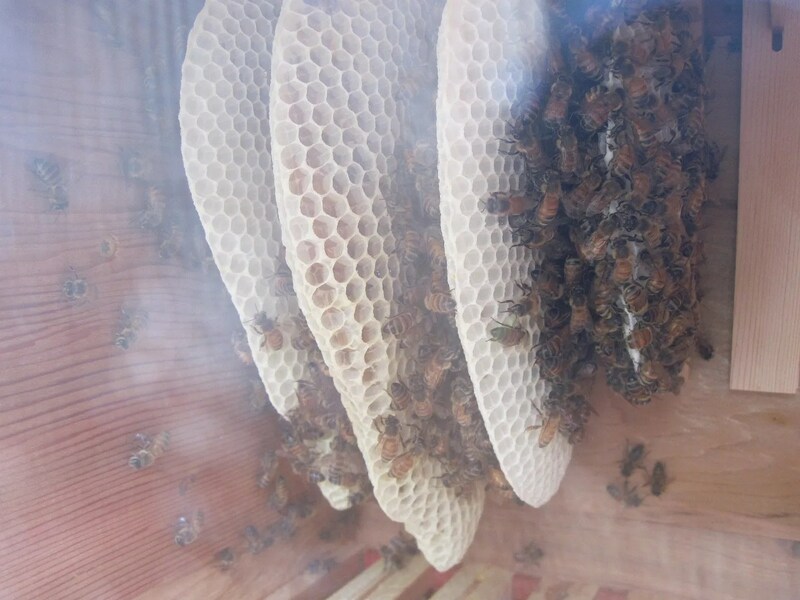 They have four pieces in the new hive so far. I really, really hope they survive – they are so incredibly awesome to watch. I like just sitting beside the hive and watching them come and go. They don’t seem to mind my presence at all. Yesterday, one landed on my shoulder and sat with me for a little bit before buzzing off to work. And I made a new quail video for you. I ended up with three girls from that last batch I hatched. One boy was lucky enough to find a new home with a friend – along with one of the girls. They other two are staying with me, and Loki could not be more delighted to have a coop and girls all to himself. The other four boys I processed for meat. That was an experience I’ll save for a latter post. Today seven of the eight quail chicks almost died. Let me tell you the story. I woke up about an hour earlier than I normally do, and it’s so fortunate that I really had to use the bathroom…and then, that I decided it wasn’t really worth going back to bed. Instead, I came into the living room and checked on the chicks. Seven of them (all but one) were laying stretched out on their sides, limp and completely cold. They apparently had left the warmth of the Brinsea Ecoglow Brooder (as they frequently do during the daytime), and had wandered to the opposite end of the brooder box, where they had been unable to find their way back in the dim light. Two of them were feebly opening and closing their beaks; the rest looked completely dead. I thought it was probably too late to save any of them. They were so cold. They almost felt like they’d been in the fridge. I picked them up and put them under the Brinsea Brooder, then found the old heat lamp I’d used for the previous hatchlings, and held that over them instead. It was a more intense, focused heat, which was, I thought, the only thing that might save some of them. And it worked. After about five minutes, a couple of them started to move slightly. I began to hope I’d be able to save at least one. By ten minutes, all but one was starting to showing signs of recovery. I was so sure that one of them was gone, though. It was completely still and cold; no signs of life whatever. If you’ve ever held a dead bird, you know what dead feels like; this one felt dead. But you should never assume a creature that “died” of cold is actually dead, until you warm it up completely. A few minutes after the rest were starting to move around, the “dead” chick opened its eyes and looked at me. All seven survived, and tonight, they are all running around as if nothing ever happened. Quail chicks look fragile, but they are surprisingly resilient. Still, if I hadn’t drank so much water before I went to bed, or if I’d gotten up even a few minutes later…I know I would have only one chick left. Miracles do happen. Lesson learned. From now on out, I’m leaving the overhead light on in the living room so the quail have enough light find their way back to the Brooder if they decide to go Crazy Quail Adventuring in the middle of the night. And that eighth chick who had enough sense to stay under the Brooder? If she’s a girl, I should name her Athena, after the Greek goddess of wisdom! Besides rescue quail, I did a little work in the garden. I’m in the process of making a small water garden inside one of my flower beds, out of a plastic tub. 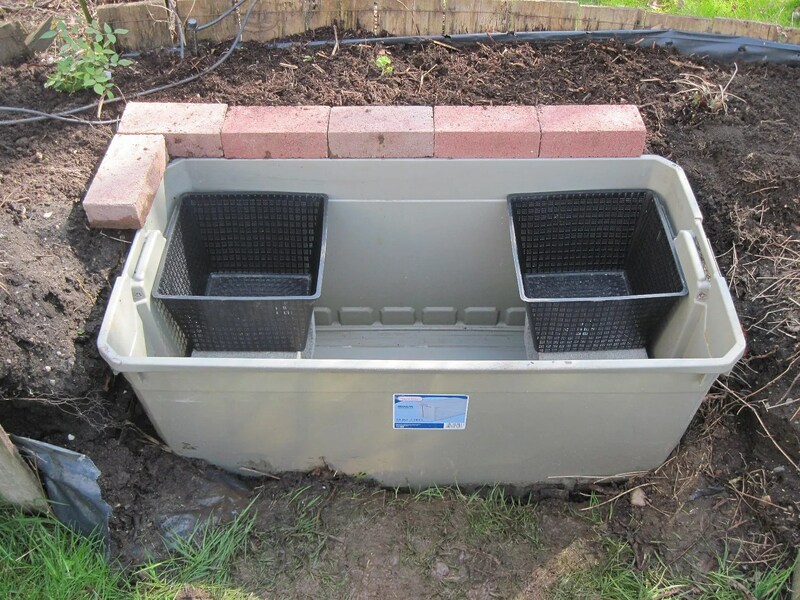 The tub is sunken into the raised bed (I will eventually bury the front of the tub as well.) It will be lined around the edge with bricks. 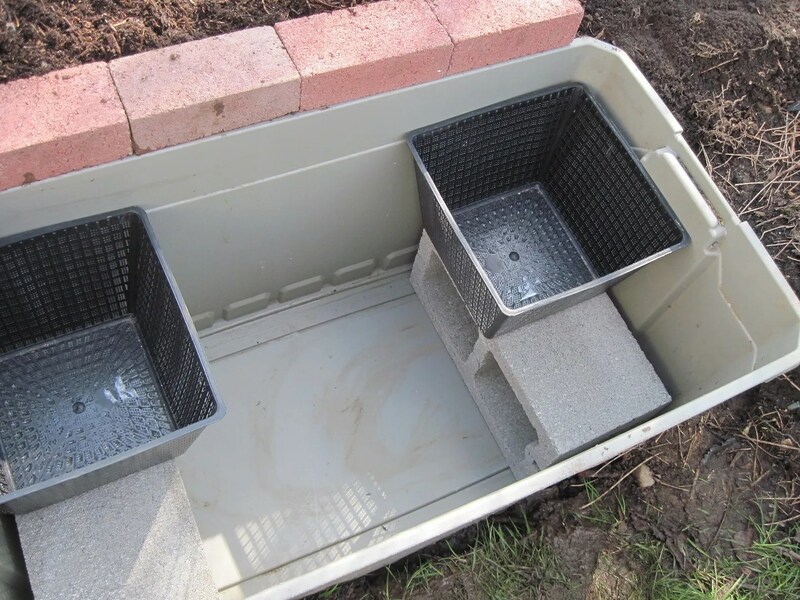 Inside are two concrete cinder blocks, to raise ledges for the plantings to sit on. The holes in the cinder blocks will be nice hiding holes for future fish. I also swung by the local nursery and picked up two more gooseberries. 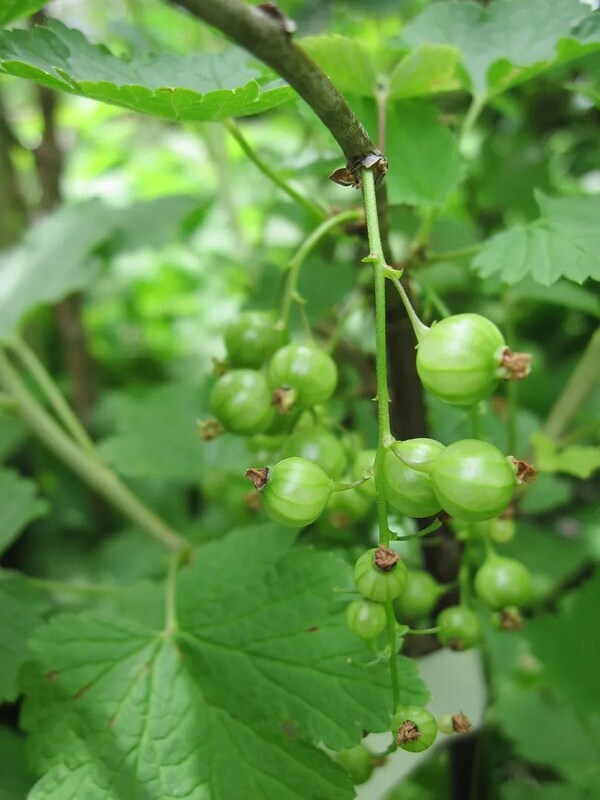 One Black Velvet, and another of the Captivator gooseberries that I planted one of last year. We got about four berries from it, and they were SO good. 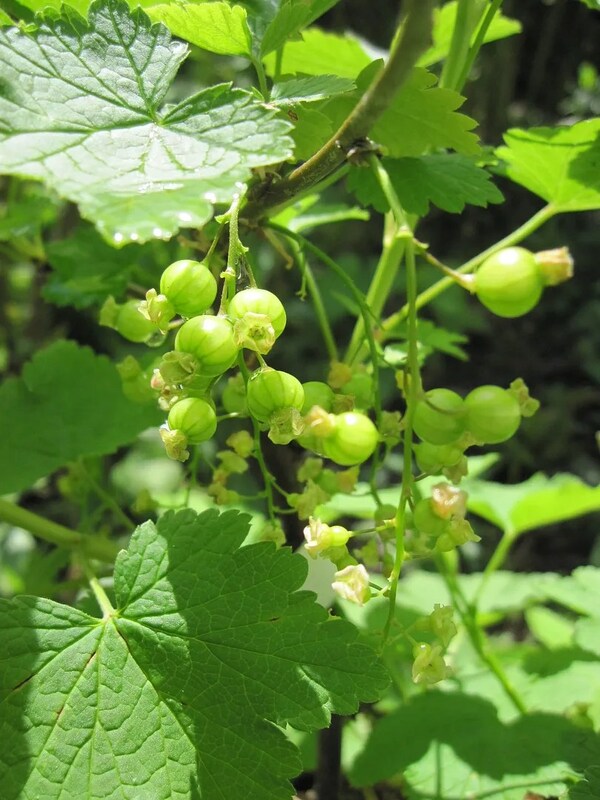 An absolutely wonderful sweet flavor, right off the bush! I knew I had to at least one more of this variety. 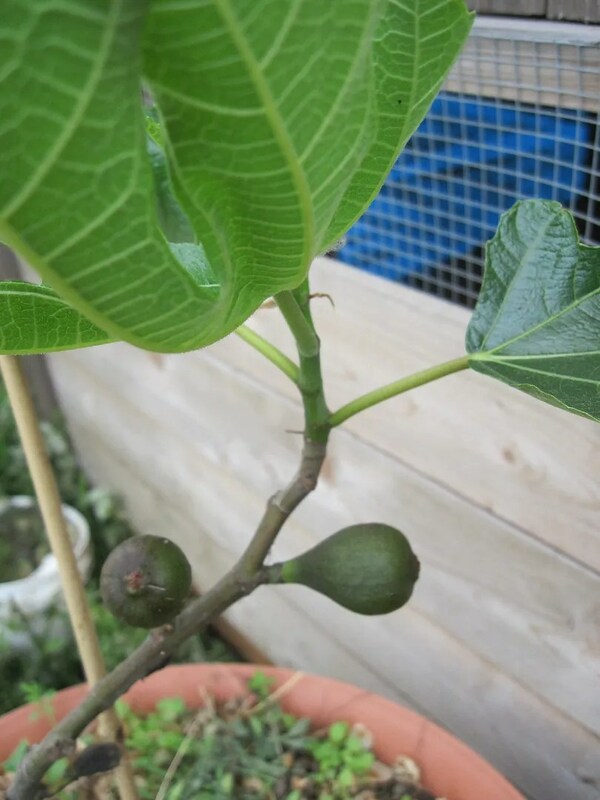 I also got a Petite Negri fig, which I will grow in a pot, and something I’d never heard of: an Apple Rose. 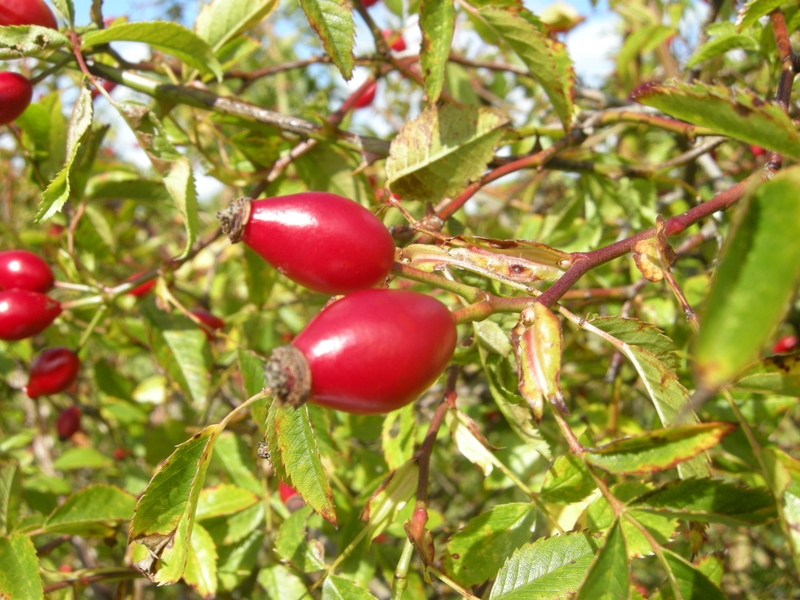 It is a very old type of rose that is grown for its large, flavorful hips. 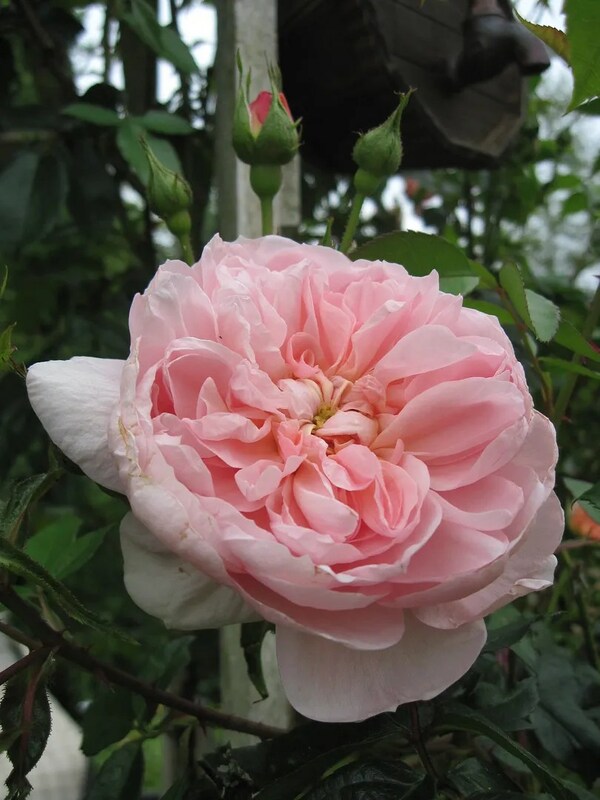 They actually had it in the edible fruit area of the nursery, rather than with the other roses. The garden is really starting to wake up. 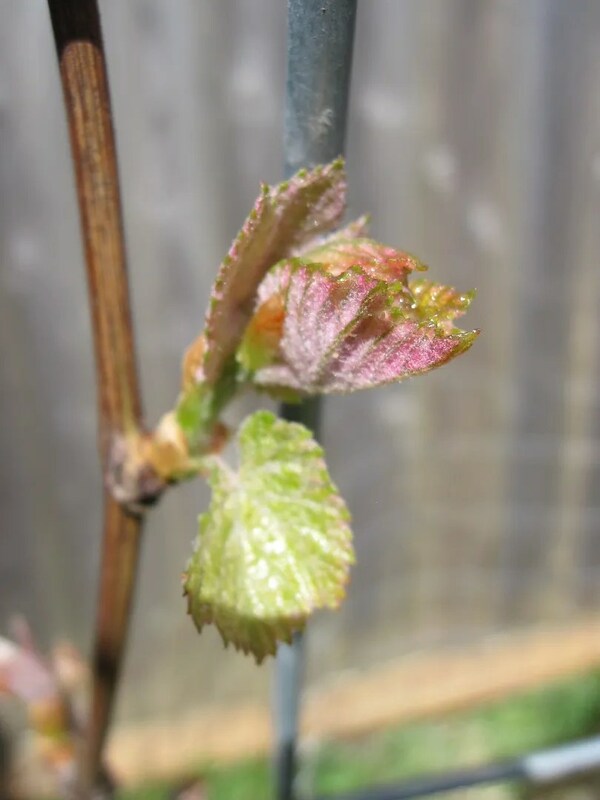 Everything is greening out, and several types of early flowers are blooming. 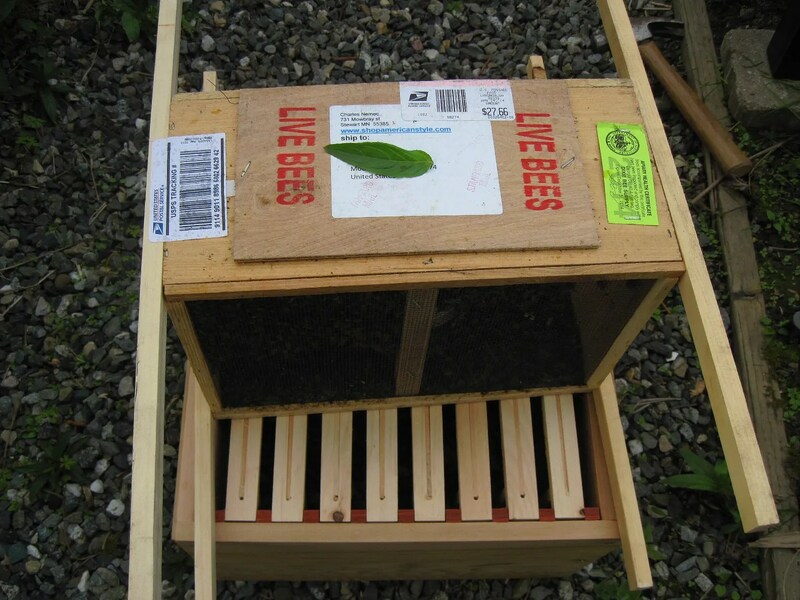 I put my mason bees out, so hopefully they’ll come successfully out of their cocoons soon. Oh! And I saw my first bee today; a bumblebee. I was so happy to see her buzzing around. She appeared to be on a mission; I suspect she was a scout out searching for a new place to build a hive. Hopefully her and her sisters will choose someplace very close to my garden, if not inside it. I adore bumblebees. 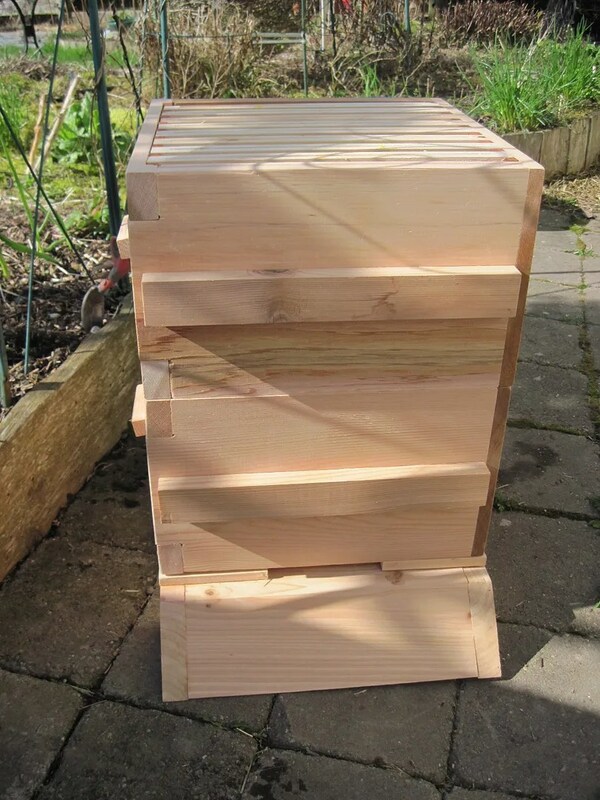 In other bee news, Mom painted the new honeybee hive, and it’s out in the garden on its new stand awaiting its new residents! 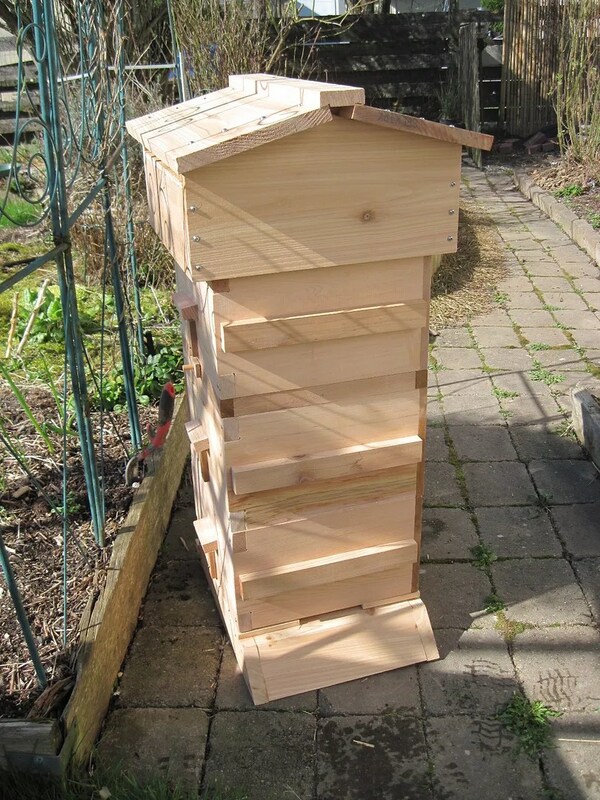 It’s a Warre hive, made by Sweet Valley Hives, and it’s gorgeous. Beautiful workmanship! 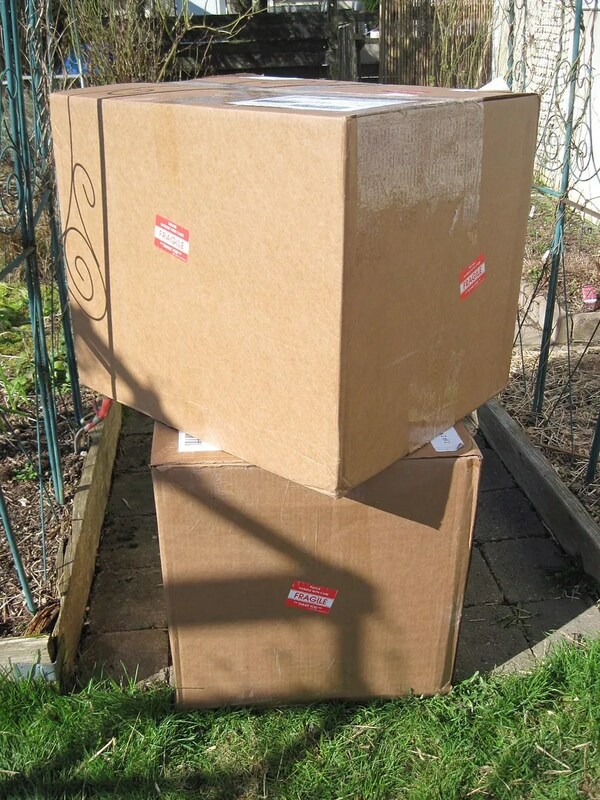 It arrived in two very large boxes. From the ground up, here’s all the pieces and how they fit together. If you want to understand what everything is, here’s a great video by the maker. 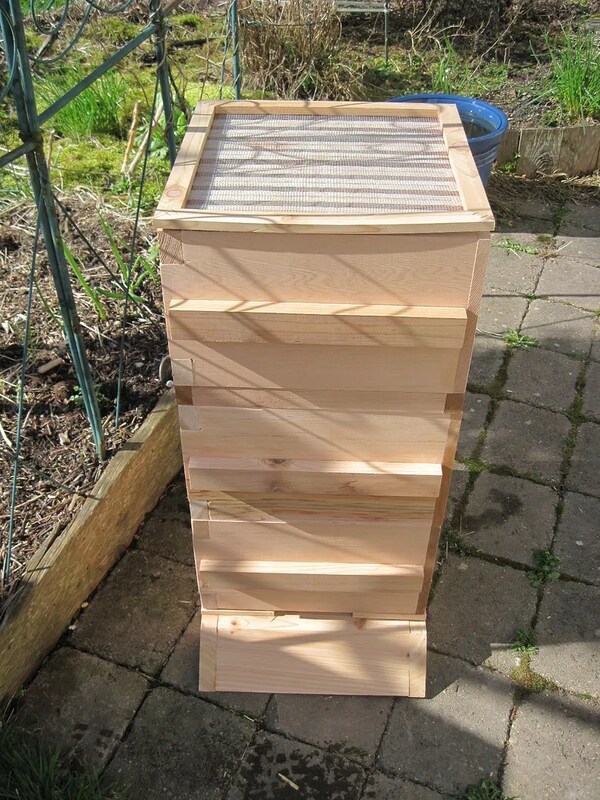 Each box has top bars for the bees to make honeycomb on. This box has an added insert of a “queen ring”. See the little rectangle plug on the left? 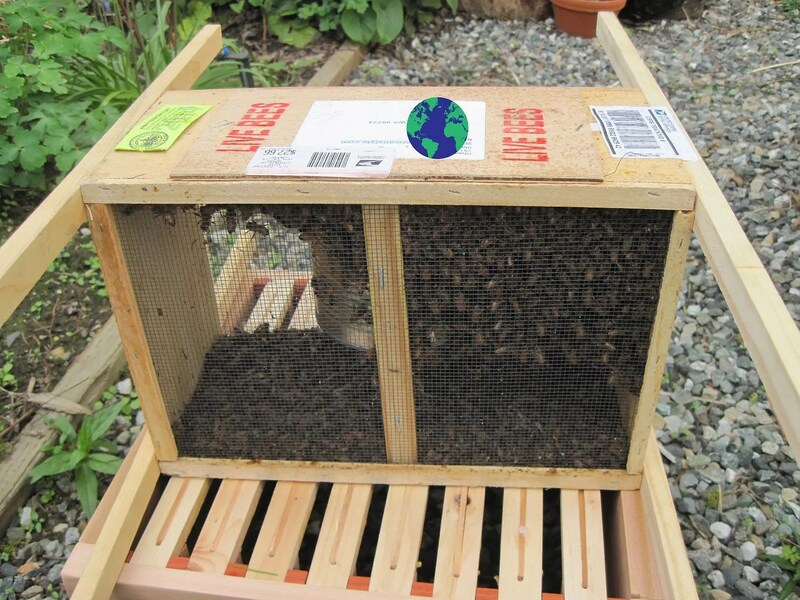 When my bees arrive, the queen will be in a separate box, just that size. I’ll take the plug out, and insert the queen’s box. Once the bees accept her as queen, they will release her into the hive, and I can put the plug back in place. It’s a brilliant little system that Sweet Valley Hives invented, and makes releasing the queen much simpler. 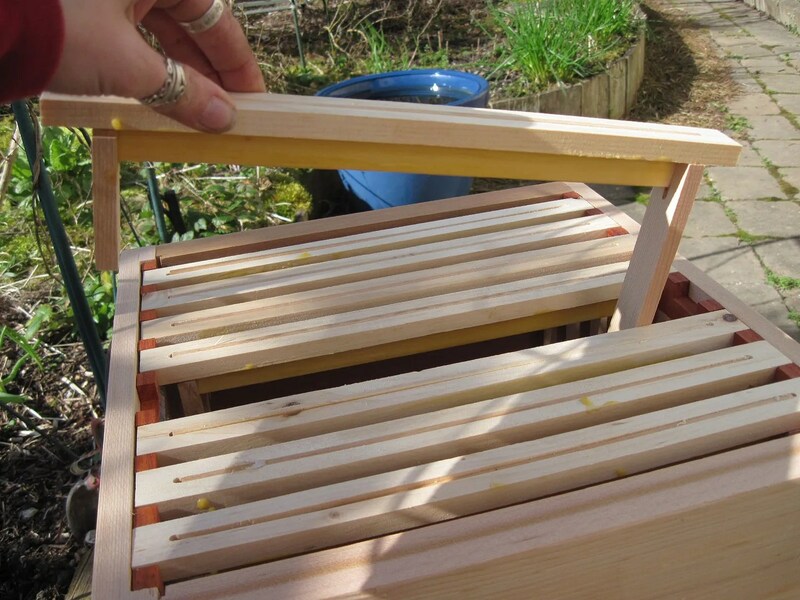 The boxes are made from cedar, and the bars are coated in a thin layer of wax; combined, the boxes smell so nice! Each box also has a glass window in the side. 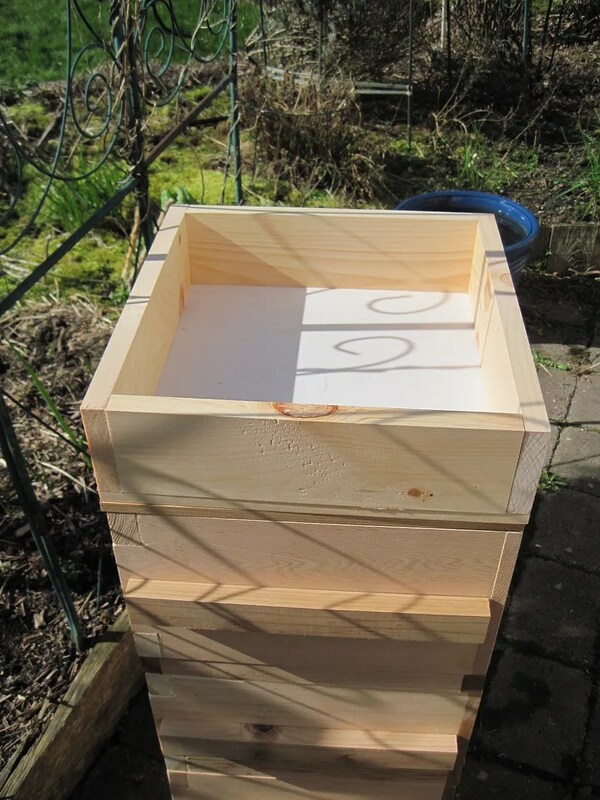 With a Warre hive, the only time you open the hive is when you harvest the honey, so it’s great to have a way of checking up on what the bees are doing. 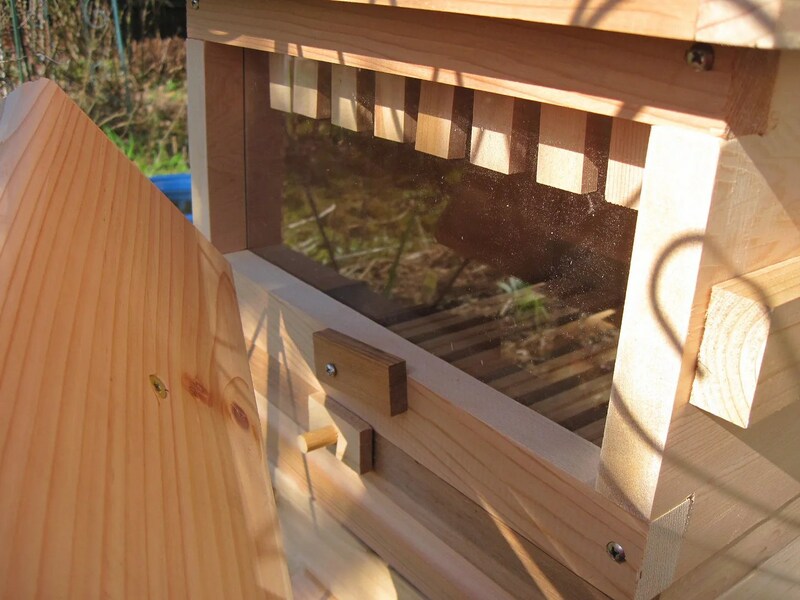 There are three boxes in total, then a screen to collect propolis. On top of the screen is a quilt box, which will be filled with shavings. Sweet Valley Hives even included a bag of shavings! 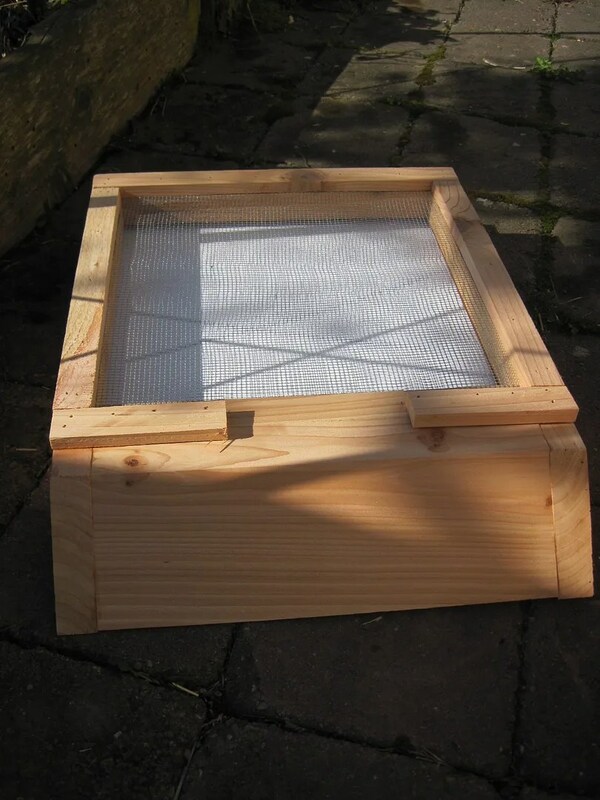 This quilt box helps regulate temperature, plus keeps moisture out of the hive. The latter is especially important in my climate. Lastly, there is a very well ventilated roof. We have to finish building the stone base, but we couldn’t resist sitting the hive in the place where it will eventually sit. Right next door to the chickens. Antoinette doesn’t appear to even notice the new housing development going up! I may have to put a divider up to redirect the bees out of the chicken yard, if there’s a problem, but I’ll wait and see. 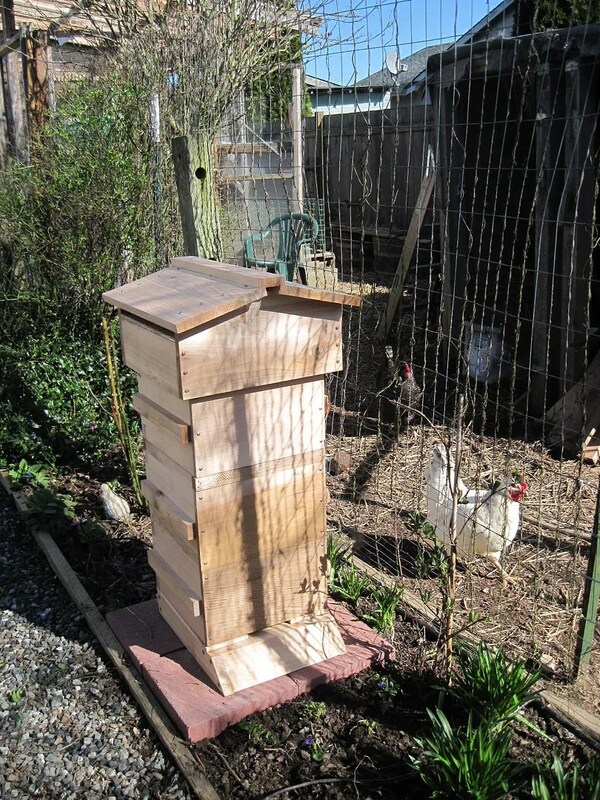 The chickens know all about bees and hornets, and give them a wide berth. When Josie was fostering her little chicks, one of the chicks found a dead hornet laying the ground. It started to peck at it, and Josie galloped over at her top speed, screaming. She grabbed that hornet away from her chicks and threw it as far as she could. And then gave them a really long, animated lecture on the dangers of stinging insects, telling them in no uncertain terms they were NEVER to touch one again. It was quite entertaining to watch!